Our annual city fair opened the doors yesterday and will be here until the 4th of August. 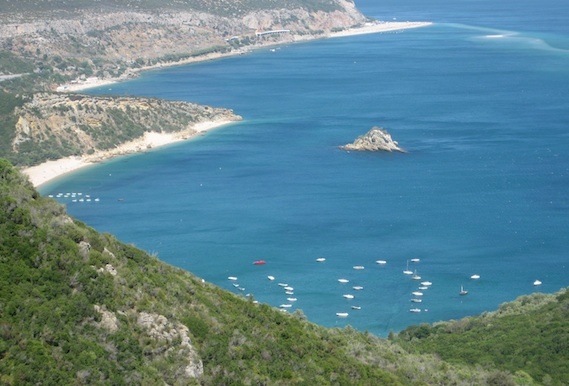 This year's theme is Arrábida (a Portuguese natural park located on the northren shore of the Sado River estuary) due to its' application to UNESCO’s World Heritage list. Besides the usual events and main attractions, there will be different artists performing every day (some days it's more than one). Yesterday was Rita Guerra, a Portuguese singer, and I went to watch her with my mum and a friend of hers. My mum is probably her biggest fan so when we found out there would be an autograph session after the concert, she was over the moon. Before the concert, that lasted from 22:30 to 1am, there was an inauguration speech from the Mayor at the entrance of the fair. Afterwards, the Afina Setúbal choir, whose members work at the Municipal Chamber, sang 4 songs before the fair was considered "open". My aunt and uncle are part of the choir, it was nice to see them there! I didn't have time to take photos of the main attractions but I don't think it is that important. I'm sure you have all seen pictures of carousels and roller coasters before! I might go back again to listen to other artists - I will make sure to write another blog post to share the experience with you.